This is the beloved Strega Nona's own story, every detail just as she remembers it, from her childhood with Grandma Concetta, who trained young Nona and her best friend Amelia, to her early days in the little house on the hill and the happy moments when she met Big Anthony and Bambolona. It is the story of a most fascinating life that has influenced and delighted countless children and adults all over the world, and it all starts with the night Strega Nona was born, when the wind was blowing dark storm clouds across the hills . . . 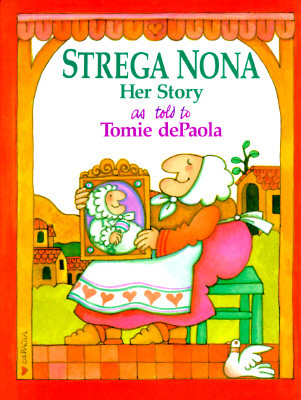 It's no surprise that award-winning author and artist Tomie dePaola was Strega Nona's choice as her biographer and portraitist, for he has put into books many stories that she has shared with him over the years, including Strega Nona (a Caldecott Honor Book), Strega Nona Meets Her Match, Strega Nona Takes a Vacation, Strega Nona's Harvest, Strega Nona's Gift, and Strega Nona Does It Again. Strega Nona's reaction when shown this book was, "Bravissimo, mio caro Tomie!" Tomie dePaola was born in Meriden, Connecticut, in 1934 to a family of Irish and Italian background. By the time he could hold a pencil, he knew what his life's work would be. His determination to create books for children led to a BFA from Pratt Institute in Brooklyn, New York, and an MFA from the California College of Arts & Crafts in Oakland, California. It drove him through the years of teaching, designing greeting cards and stage sets, and painting church murals until 1965, when he illustrated his first children's book, Sound, by Lisa Miller for Coward-McCann. Eventually, freed of other obligations, he plunged full time into both writing and illustrating children's books. He names Fra Angelico and Giotto, Georges Rouault, and Ben Shahn as major influences on his work, but he soon found his own unique style. His particular way with color, line, detail, and design have earned him many of the most prestigious awards in his field, among them a Caldecott Honor Award for Strega Nona, the Smithsonian Medal from the Smithsonian Institution, the Kerlan Award from the University of Minnesota for his "singular attainment in children's literature," the Catholic Library Association's Regina Medal for his "continued distinguished contribution," and the University of Southern Mississippi Medallion. He was also the 1990 United States nominee for the Hans Christian Andersen Medal for illustration. Tomie dePaola has published almost 200 children's books in fifteen different countries. He remains one of the most popular creators of books for children, receiving more than 100,000 fan letters each year. Tomie lives in an interesting house in New Hampshire with his four dogs. His studio is in a large renovated 200-year-old barn. - He has been published for over 30 years. - Over 5 million copies of his books have sold worldwide. - His books have been published in over 15 different countries. - He receives nearly 100,000 fan letters each year. copyright © 2000 by Penguin Putnam Books for Young Readers. All rights reserved.